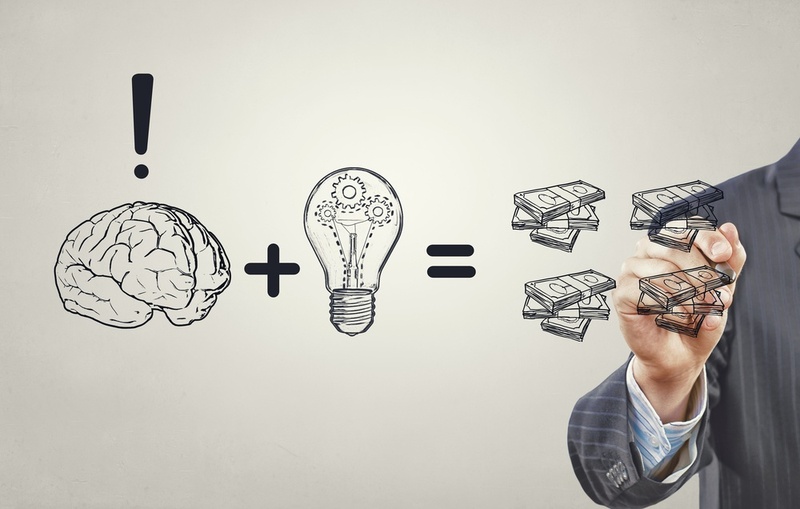 Question: Do you want less risk, better returns and to pay less in taxes on your investment? I think it is fair to say the answer to that question is an emphatic “YES!” for most business owners. This next question is a little harder to answer: Which is a better investment for a building owner, investing in the stock market or investing in an energy efficiency project for your building? This article will discuss 4 reasons why I believe the answer to that question (which might be surprising and eye-opening for some) is – an energy efficiency project is the better investment! This example (below) compares the performance of Dow Jones Index over the past 9 years versus a typical energy efficiency project. The energy efficiency project yielded a conservative 5-year simple payback, equating to a 20% return on investment. In this case the Energy Project would have yielded $5.16 (net gain of 4.16) versus the DJI which would have only yielded you $2.82 (net gain of $1.82)! Do we have any control over Wall Street’s performance? No. 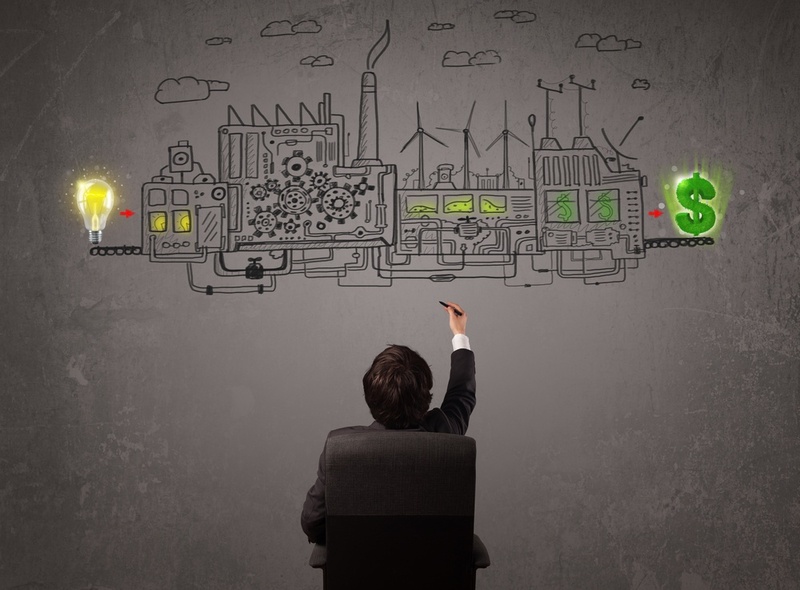 Do we have more control over an energy efficiency project? Yes. Can you predict what the stock market will do? Are building operations relatively constant year to year? Do you have energy bills every year? 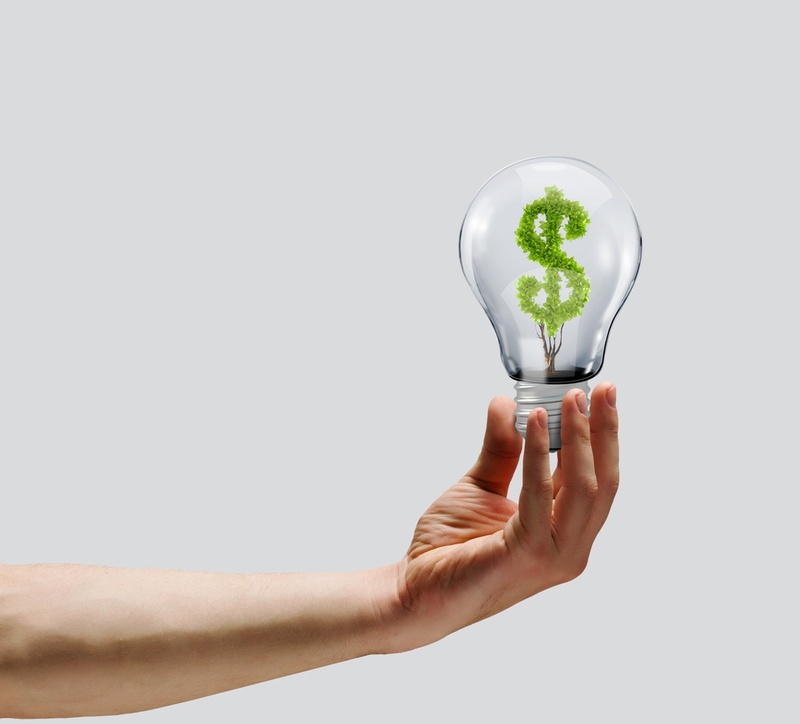 Are your energy bills inevitable, even if you don’t invest in an energy efficiency project? Is reducing those bills an investment worth capturing? Do you have another investment/project that beats 20%? Maybe you do, but will it continue to do that every single year? 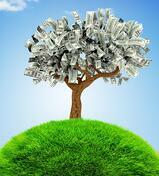 An energy efficiency project will! 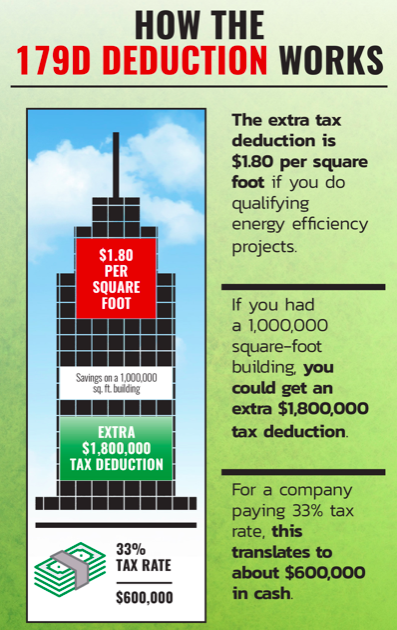 “The extra tax deduction is $1.80 per square foot if you do qualifying energy efficiency projects. For example, if you had a 1,000,000 square-foot building, you could get an extra $1,800,000 tax deduction. For a company paying 33% tax rate, this translates to about $600,000 in cash. "The 179D Commercial Energy Efficiency Tax Deduction is a special tax break that’s not linked to assets, but related to square footage of a building that installed energy-efficiency equipment. Therefore it’s an extra tax deduction to take advantage of (if your project qualifies)." 10% Tax Credit on Geothermal! If you choose to install an energy saving, Geothermal Energy System in your commercial building - you will receive a 10% Federal Tax Credit on the installation cost. 30% Tax Credit on Solar! For choosing to install an energy savings Solar/Photovoltaic Energy System on your commercial building through an energy efficiency project - you will receive a 30% Federal Tax Credit on the installation cost. Reason 3: The Public Likes It! In the research article below, John R. Wingender and Eric A. Woodroof found substantial evidence that:“Announcements of energy management projects correlate with a 21.33% increase in stock price.” The researchers examined 23 publicly traded companies that made announcements about their Energy Management Project in a major US newspaper, news wire or a monthly trade magazine between the years of 1986 and 1995. Reason 4: New Equipment, Better Controls, Less Maintenance & Better Operating Efficiency! IT’S GOOD FOR THE ENVIRONMENT AND OUR WORLD'S FUTURE! We hope this article was helpful and interesting to you!